Vanilla ice cream is produced in the Ice Cream Maker and is unlocked at level 29. Each ice cream cone takes 2 hours to be produced, or 1 hour and 42 minutes in a mastered machine. 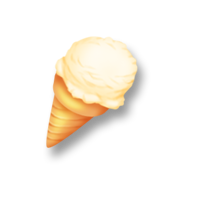 Ice cream can be bought or sold for a maximum price of 1,728 coins for 10 cones. Buying the ingredients required to make it costs 132 coins. Ice cream is an extremely sought-after item. You rarely find it in the Daily Dirt. You may want to make sure you always have some in stock or in production.